Up to $150 in value (YOURS FREE)! Get Your Fast & Easy FREE Quote! Who are you looking to get protection for? Are you looking for protection in-home or on-the-go? Which are you most interested in? Just give us a few more details to complete your personalized quote! Integrated mobile app and two-way messaging make this all-in-one wearable medical alert the most reliable senior smartwatch on the market. Proven in-home personal safety using your home's landline. Offers 1,300 ft2 of protection - the largest range available on the market today! Guaranteed in-home personal safety, no landline required! Equipped with time and temperature display, and Fall Detection-capable. GPS-enabled and portable, provides around the clock personal safety both at home AND on-the-go! Keep doing what you love both inside and outside with an all-in-one medical alert system with GPS, WiFi, and optional fall detection capabilities. Choose between our comfortable and lightweight neck Pendants, Wrist buttons or all-in-one wearable system. Get immediate help even if you’re unable to push the button with our advanced fall detection technology. GPS and Wi-Fi technology will find your exact location and get you the instant help in any emergency. A low cost of a medical alert system is often a sign of subpar service, hidden fees, and potential scams. A monitoring center’s certifications give you insight into the kind of response you’ll receive in an emergency. A company that puts a premium on providing top-notch service is well worth the investment. No matter what type of medical alert system is the best option for you, it needs to be reliable and durable. Clear, step-by-step instructions help ensure that the medical alert device is installed easily and correctly. Reviews from third-party sites and existing customers allow you to gauge what your experience will be like. WATCH Find out what Joey did when he fell and his phone was out of reach. WATCH Learn how one simple decision helped Beth's family worry less. There’s no "one size fits all" when it comes to your safety, which is why we allow you to completely customize your medical alert package. 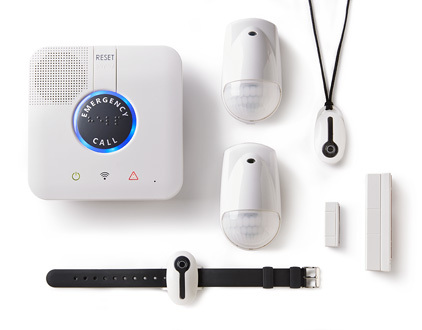 Thanks to our top-rated accessories, like our Lockbox and fall detection pendants that are compatible with both our our in-home systems and personal medical alert devices with GPS, Medical Guardian can help you find the perfect fit. Your Welcome Kit includes everything from a User Guide to a free EMT Information Card. Thanks to our simple, 3-step activation process, your system is ready to use in no time. With our concierge-style service, Customer Care Specialists walk you through the entire process. Medical Guardian provides reliable, nationwide coverage thanks to our 24/7 monitoring center. We know that there’s no room for error when an emergency strikes, which is why our top-rated monitoring center is held to the highest set of standards in the industry. Rest assured that we’ll have your back in any situation by checking the coverage in your area . Call Now for Special Offer! This detailed brochure shows how our innovative product suite – ranging from medical alert systems with GPS to fall alert devices – is designed to fit any lifestyle. *** Offer valid for Annual subscriptions by new customers only. *** Available for select Medical Guardian subscription plans only. Ask your Life Safety Consultant for more information. *† By submitting your information to request a free quote, you consent for Medical Guardian to use automated technology including pre-recorded messages to contact you at the number provided. This number is not required to make a purchase from us. Speak with one of our Life Safety Consultants TODAY! Check back at 8AM EST for updated offer.